We all know about smartphones, smartwatches, and even smart glasses but do you know that a smartpen already exists? The team over at Equil is about to release its second generation smartpen called the Equil Smartpen 2. So what does this device do? Basically it easily transfers anything you write or draw on paper to your Android or iOS device. The best part of this is that no special paper or ink is required. You can use any regular paper as well as standard and replaceable ballpoint ink cartridges. There are actually two components needed for this device to work. The smartpen itself and the sensor. The sensor is attached to the top part of the paper before a person starts to work. The sensor then uses a combination of ultrasound and infrared to determine the exact position of the pen on the paper. This data is then sent to a mobile device to be converted digitally. The Equil Smartpen 2 has a wide market audience owing to the fact that it is very usable. Illustrators can easily send their drawings from paper to their tablets. Students taking down notes can easily store these notes on their mobile devices. One feature that this device has is that the text that has been converted digitally can still be edited thanks to its built-in handwriting recognition. 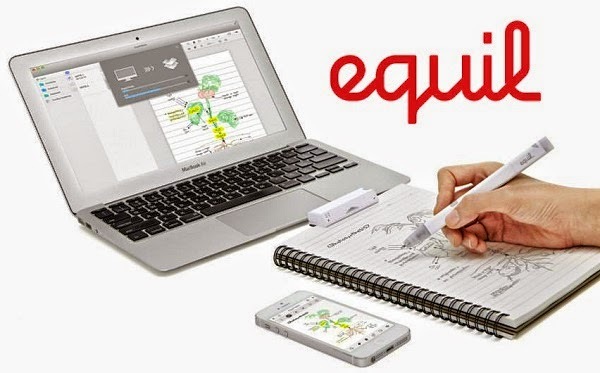 The Equil Smartpen 2 recently ran a funding campaign over at Indiegogo with the target of raising $50,000. As of this writing the total amount raised has reached $257,562 which just goes to prove that a lot of people love his idea. The first batch of this product ships out this October and costs $169. Those who wish to support the campaign can head out over to Indiegogo and get one for as low as $109 (60% off the retail price).